Property developer Berjaya Land Bhd (BLand) has lined up a slew of new launches this year and next as it sees signs of recovery in the local property market. It has 10 projects in hand worth some RM1.2 billion. "Based on the sales of properties at our ongoing developments, we believe the market is heading back to normal. Next year will be more exciting for us as we will introduce new product launches," BLand senior general manager of properties and marketing, Mah Siew Wan, told Business Times in an interview. 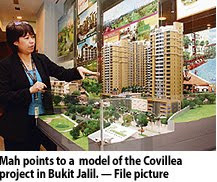 The company plans to launch a RM150 million residential project called "Covillea" in November, within its 160ha Bukit Jalil development in Kuala Lumpur. Covillea comprises two blocks of apartments totalling 308 units, priced from RM400,000 per unit. "We will launch five or six more projects in phases at our Bukit Jalil development over the next few years. Bukit Jalil is a mature township. It has a golf course and is located 15-20 minutes away from the city and we are confident of the take-up rate," Mah said. BLand is one of the earliest developers in Bukit Jalil. It bought the 160ha land before the Sukom 98 games. To date, it has used 64ha for an 18-hole golf course and a clubhouse to spearhead developments in the area. BLand has been active in opening up new projects to sell, despite the slow market sentiments and economic uncertainties. It had opened for sale five projects in the Klang Valley since the first quarter of this year. They are Savanna 2 @ Bukit Jalil, comprising four blocks of condominium villas worth RM32.5 million, The Peak @ Taman Tar featuring 88 bungalow lots worth RM354.4 million, and Vasana 25 @ Seputeh Heights, consisting of three bungalows and 22 link villas worth RM150 million. The other two projects are Hazel 2 @ Shah Alam, comprising 87 units of terraced houses worth RM32 million, and 1 Petaling @ Sg Besi, featuring a 21-storey building with 250 units of condominiums and 32 units of shoplots, worth RM73 million. BLand has achieved 20-25 per cent sales from the properties, but for 1 Petaling, 50 per cent of the units have been sold, Mah said. She believes that sales will improve, given that people are starting to look for new homes. BLand has other projects like The Link @ Bukit Jalil, featuring three and four storey shop offices, Kinrara Mas Shop Apartment in Puchong, Seputeh Heights with 103 bungalow lots, and Kuantan Perdana, comprising 37 units of shopoffices. The properties are worth around RM350 million and 80-95 per cent have been sold. BLand, a Berjaya Corp Bhd unit, posted net loss of RM102.15 million last year, compared with net profit of RM1.11 billion a year ago due to the absence of exceptional gains. Revenue, however, jumped nearly threefold to RM4.2 billion, mainly due to higher contribution from the gaming business arising from the full year consolidation effect of Berjaya Sports Toto Bhd. Property developer Glomac Bhd will focus on developing commercial and high-end residential developments such as the Suria Stonor in Kuala Lumpur City Centre as they offer better margins, its top official said. "That is our forte ... our strength in actively putting out niche projects. 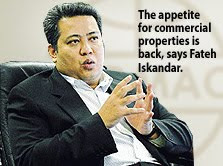 For commercial properties, we see that the appetite is back," group managing director Datuk Fateh Iskandar Mansor said after the company's shareholders meeting in Kelana Jaya, Selangor, yesterday. Glomac, which has 13 projects in hand worth RM3 billion, has lined up new launches for the current year, worth almost RM500 million. "With the government stimulus packages, we see some improvements in the economy. I think the worst has past and things are stabilising," Fateh Iskandar said. Glomac has in the pipeline projects worth more than RM2.5 billion to launch from 2010. Fateh Iskandar said Glomac got off to a good start in the current year as it sold Wisma Glomac 3 and Block B of Glomac Business Centre for RM72.6 million. The company is also seeing significant contributions from Glomac Tower, a Grade A commercial building in Kuala Lumpur which was sold to a Bumiputera firm for RM577 million in December 2007. "We have received payments of RM290 million from the sale of the property. Glomac Tower would contribute to our earnings until 2012, but we have Glomac Damansara and Glomac Cyberjaya to anchor us," Fateh Iskandar said. Meanwhile, Glomac group executive vice-chairman Datuk Richard Fong said the government is not doing enough to promote the sale of Malaysian properties to foreign buyers. He said if the government can improve the Malaysia My Second Home programme, it would help stimulate the economy and drive property sales. PETALING JAYA: Property developer Glomac Bhd hopes to achieve at least 15% increase in earnings when its financial year ends on April 30 (FY10), supported by projects in hand it has now. For FY09, it reported a 8.12% decline in net profit to RM32.3mil on revenue of RM351.57mil. Group managing director/chief executive officer Datuk FD Iskandar Mohamed Mansor said the group currently had in the pipeline property projects with an estimated gross development value of about RM3bil that would last for another five years. “The five-year period is based on our average launch of about RM600mil in projects a year. We are optimistic of achieving the target figure as we know what our current unbilled sales are now. “Apart from that, we managed to lower our gearing level to 0.12 times now from 0.35 times and this will certainly help our cashflow to be more positive,” he said after the company AGM yesterday. On the group’s existing landbank, Iskandar said Glomac had about 400ha for future development and was looking for niche parcels of land to acquire in the Klang Valley. “We are not looking for bigger (plots of) land. Instead, we are looking for niche land in the Klang Valley as the most important thing is the location. We plan to develop commercial and residential projects if we manage to buy the land,” he said. He believed the property sector had not fully recovered yet though there was already some pick-up in certain locations. “Confidence level among the buyers/investors seems to be improving now but only for certain locations. We hope by the second half of next year, the property sector in general will be fully recovered,” he said. He added that commercial properties were currently picking up based on the recent launch of the group’s commercial projects. “Our Glomac Damansara and Glomac Cyberjaya for example, received very positive take-up when launched just recently,” he said. Iskandar also said the group was looking for potential business ventures in the region after setting foot in Thailand and Australia. For the first quarter ended July 31, Glomac recorded net profit of RM8.3mil on revenue of RM59mil compared with RM7.8mil and RM79.5mil in the previous corresponding period. Iskandar Investment Bhd, a government company tasked to build catalytic projects in Iskandar Malaysia in Johor, will give out RM2 billion worth of contracts next year. The contracts include jobs to build hotels and a shopping mall surrounding the Legoland theme park, president and chief executive officer Arlida Ariff said. She said the company has awarded over RM1 billion worth of construction jobs before this and it is stepping up the development pace at Iskandar Malaysia. WCT Bhd, an infrastructure firm, had in July won contracts valued at RM767 million to build roads and sewerage there. Property and construction firm Mitrajaya Holdings Bhd has also won jobs from Iskandar Investment. "We've spent the last few years planning and firming up deals, now it is time to convert those investments into activities that will stimulate more works on the ground," Arlida told a media briefing in Kuala Lumpur yesterday. Next year's contracts are mainly for the construction of buildings that include a medical school and student residences, residential units within the Medini cluster, and amenities around Legoland. The completion date for Legoland has been brought forward by about a year and it is now scheduled to be ready by April 2012, Arlida said. At least one hotel in that area and a shopping mall, will be ready by the time the theme park opens its doors, she said. There will be a four-star business hotel and another resort hotel around Legoland, she added. Arlida said Iskandar will bring in partners, both local and foreign, to work on some of the projects. "Towards this year-end and into next year, we hope to announce at least three more partners and bring in three more universities into Educity (within Iskandar Malaysia)," she said. "The next two months are very busy for me. I'll be travelling to five countries to finalise deals." She will be travelling to Dubai, the UK, Australia and India in the next two months. "It's time to expand beyond the current markets and partners that we have now. There's still a lot of room for growth," she said. Iskandar Investment's reputation and credibility is more solid now that it has awarded a big sum in contracts, she remarked. "We have given out over RM1 billion contracts. This is an affirmation that the project is for real." KUALA LUMPUR: Iskandar Investment Bhd (IIB), the catalytic developer of Iskandar Malaysia, will award RM2bil worth of projects over the next 12 months, says president and chief executive officer Arlida Ariff. The tenders, she said, would comprise projects under the Ninth Malaysia Plan (9MP), of which RM1bil had been allocated, and those investment committed by IIB. “The tenders to be awarded under the 9MP allocations are mainly infrastructure projects. “Meanwhile, 80% of the investment committed by IIB will be for infrastructure and the balance for mixed development,” Arlida told a briefing on the sidelines of the Forbes Global CEO Conference yesterday. She said the tenders would involve infrastucture in Medini and EduCity as well as accommodation units for students at Newcastle University Medicine Malaysia. Arlida said the duration of contracts ranged from six to 24 months, depending on the job scope. Asked if IIB had identified any contractors, she said the company had since 2007 relied on a list of registered qualified contractors. Currently, it has about 1,000 names on that list. “We don’t negotiate directly with contractors. We tender all our projects,” she said, adding that tenders would be limited to contractors registered with IIB. To date, IIB has awarded about RM1bil worth of works for the development of Iskandar Malaysia. IIB, an investment holding company which works closely with the Iskandar Regional Development Authority, now owns 2% of the Iskandar region covering 2,200 sq km. Arlida said Iskandar had to date attracted US$13bil (about RM46bil) worth of investments. IIB also expects to generate RM1bil worth of investments from the spillover of Legoland Malaysia, which has two hotels, one retail mall and an office building on a 45-acre site. Currently, the company is in talks with potential partners. “We hope to announce three more partners by the end of this year,” she said, adding that IIB would be busy over the new few months visiting and talking to potential investors. The property website had analysed its visitor traffic data over the last three months and compared it with the status last year. Over 80 per cent of the visitors were interested in buying or renting property in Malaysia, Thinkproperty.my said in a statement. 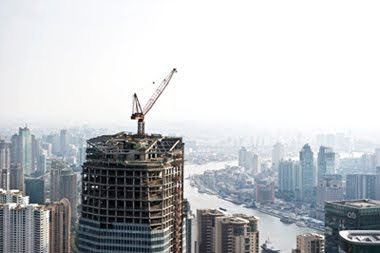 While there was increased interest from Malaysian property buyers, it was less among those from countries such as Singapore, the UK, India, Australia, Japan, the United Arab Emirates and Pakistan, it said. "This is to be expected because Malaysia's property market has been stable.The Malaysian experience of seeing property as an investment has also been more positive compared to those of most other countries," he added. According to Qureshi, Malaysia is doing a good job of getting the Malaysian story across overseas in marketing itself as the gateway to Asia because of the lack of a property gains tax, liberal ownership rules as well as a strong banking sector. "These are all strong pull factors for the country. "However, the weak global economy must be the prime culprit for the lower level of foreign interest this year. There is not much Malaysia can do about it, except wait," he said. On a positive note, he said there was some increased interest from China, Vietnam and Thailand, though Hong Kong's level was unchanged. "In my view, this should be a hint for both the government which is trying to promote Malaysia's real estate abroad as well as developers trying to do the same. "The focus should increasingly be Asia. Asia is leading the world out of recession. Asian investors will likely play an increasingly important role in Malaysia's property market in future," he said. Eddie Chen, the head of Marketing of Think Media Sdn Bhd, pointed out that Thinkproperty.my's absolute visitor figures have risen by 409 per cent from this time last year. "The shift has been dramatic and in my view, it's merely the tip of the iceberg. We are conservatively expecting traffic to increase at least a further 300 per cent between now and 2010." PETALING JAYA: While China’s property market is making a comeback and prices are recovering from a sharp drop of up to 50% following the global financial crisis, markets in Europe are still struggling. According to Chinese economist Steven Xu Sitao, this unbalanced and contrasting scenario does not augur well for the world, which is still in the midst of a recession despite the trillions of dollars in stimulus packages that have been pumped into the global economy. Xu, who is chief representative of China for the Economist Group and director of advisory services for China’s Economist Intelligence Unit, however, cautioned against too much optimism for China as he noted that the needed industry shake-out of his country’s property sector had failed to materialise. “This may soon precipitate risks of potential bubbles that China has to pay in the years to come,” he said in an e-mail response on China’s property market. Xu is one of four keynote speakers who will be sharing their views at the FIABCI Malaysia Global Summit 2009 in Kuala Lumpur this Saturday on how interventions by various governments worldwide turned in different results and how property players should react. The other speakers are Prof Paolo Garonna, director-general of Association of Italian Insurers; Allan Saunderson, founder and managing editor of Property Finance Europe and Property Investor Europe; and Dr Philippa Malmgren, former financial market advisor to the US President. Garonna, who is former deputy executive secretary of the United Nations Economic Commission for Europe, said the global crisis would not have been so acute and serious in Europe and much of the world had real estate prices remained anchored to fundamentals. According to Yeow Thit Sang, the organising chairman of the global summit themed Reviving The Economy Through Real Estate Growth, it would be important to study the weaknesses that caused the markets to cave in in the first place and to find solutions to soften the impact of the fallout to the real economy. “Unless we understand why this recession happened, we won’t be able to get out of it,” he said. MAH Sing Group Bhd has for the second straight year bagged the "Best Developer" in the esteemed Euromoney Real Estate Awards 2009. Currently in its fifth year, the award canvasses the opinions of real estate developers, advisers, financial institutions, investors and end-users worldwide. The organiser, Euromoney Liquid Real Estate, is a leading publication focused on international real estate financial markets. The group said despite the challenging external environment, it has overshot its full year sales target by 1.2 times, achieving RM543 million sales in just over seven months and went ahead with land acquisitions to strengthen long-term prospects. Mah Sing Group has a total of 18 projects with remaining gross development value and unbilled sales of approximately RM4.5 billion strategically located in the Klang Valley, Penang Island and Johor Baru. PETALING JAYA: Mah Sing Group Bhd has been named “Best Developer” in the Euromoney Real Estate Awards 2009 organised by Euromoney Liquid Real Estate magazine. The award canvasses the opinions of real estate developers, advisors, financial institutions, investors and end-users worldwide. Mah Sing group managing director and chief executive Tan Sri Leong Hoy Kum said in a statement the company was gratified to win the award for the second year running.